When using Google Maps to get you somewhere you’ve never been before, it will normally tell you that you are on the fastest route, and you should reach your destination by a very precise time. This is all well and good when traveling to a destination in the suburbs or rural areas, where parking will most likely be free and you essentially park at the front doors. However, when your destination is in the heart of a major metropolitan area, you can sometimes add 15 minutes or more to your ETA if you’re driving around in circles near the address of your destination frantically looking for a lot or garage to park in that isn’t full, or if you’ve parked too far away to save a few bucks and forgot to add the extra walking time. 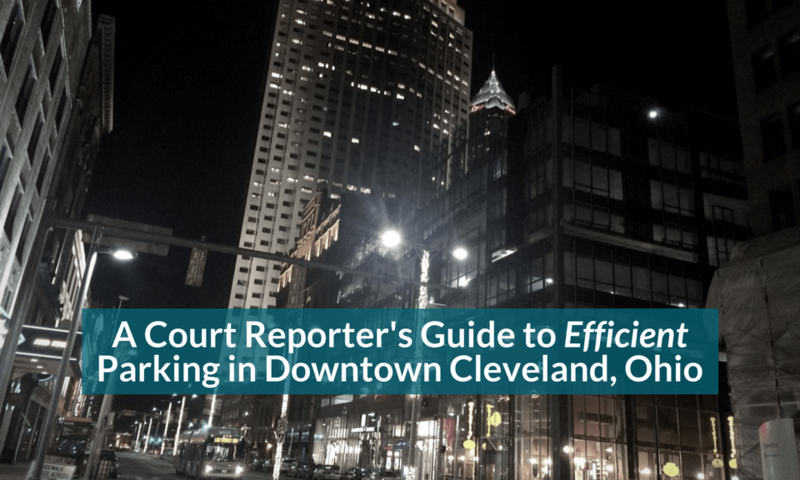 So why would a court reporter know anything about efficient parking in Cleveland, Ohio? It’s pretty simple. The profession of a court reporter who works mainly in the discovery phase of civil litigation is not a traditional 9 to 5 job and rarely involves going to the same place two or more days in a row. Instead, we usually find out the time and location of our assignments the evening before and then plan for the next day accordingly. In some cases, we are called upon to be somewhere “as soon as you can” (meaning 10 minutes ago) when there has been a mix-up in scheduling and there is a room full of attorneys and a nervous witness all awaiting our arrival so the deposition can begin. As a court reporter working in Cleveland for the past 16 years, I have become an expert of sorts in finding the perfect place to park all over the city, taking into account accessibility, convenience, walk time from car to office (extremely important), weather conditions, and some other factors that need to be considered when you are expected to be the first one to arrive at a deposition and to be set up and ready to go on the record without making anyone else wait for even one minute past the scheduled start time. I have probably been in every building downtown at least once and know some great shortcuts through buildings and underground to reduce the amount of time walking outdoors in the frigid winters off the shores of Lake Erie. The Downtown Cleveland Alliance identifies eight distinct neighborhoods (or districts) that make up what most in Northeast Ohio consider “Downtown Cleveland.” In this article, I will briefly describe the boundaries of six of these districts and reveal what I consider to be the best places to park in each. My apologies to those looking for recommendations in the Campus District and Northcoast Harbor, but the lack of office buildings in these neighborhoods means I am not there very often and have none. Before we begin, I must note that price is not taken into consideration for any of my recommendations. This article is about efficient parking, not parking on the cheap. I quickly learned in my first year of being a court reporter that saving a few bucks for parking is not worth the anxiety you feel when the deposition is starting in 15 minutes and you decided to pay $5 less to have a 10-minute walk (into the wind in all directions) on an eight-degree February morning. The Civic Center District is home to the absolute center of the City of Cleveland as a whole, with all east side and west side numeric city streets ascending outward in opposite directions from Ontario Street and Public Square. On its southern border is Public Square itself, which is surrounded by the three tallest buildings of Cleveland’s skyline; the iconic and historic Terminal Tower, The Huntington Building (formerly BP Building), and Key Tower. The western border would be Ontario Street, including the Justice Center and the new Hilton Cleveland Downtown. The northern border is Lakeside Avenue, including the Old Courthouse, Cleveland City Hall, the Cleveland Convention Center, and Cleveland Public Auditorium. The eastern border would probably be East 6th Street, including the Drury Plaza Hotel Downtown Cleveland, the Westin Cleveland Downtown, as well as the beautifully refurbished Calfee Building at 1405 East 6th Street. The Civic Center District is relatively large, and the southernmost portion is somewhat cut off to vehicular traffic with confusing one-ways and the newly designed Public Square. Subsequently, I have three favorite parking structures depending on the location of the job. Parking in the underground Key Tower/Marriott garage can get you quickly not only to any office in Key Tower, but also to the Justice Center with minimal time outside. The entrance is off St. Clair between East 6th Street and Ontario. Once inside the garage, there are only a few left turns to get you to the public parking spaces, and a quick walk to the elevators will get you up to the lobby of the Marriott. 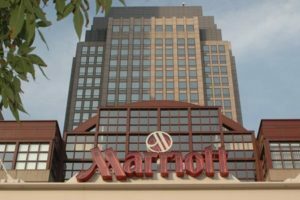 Walk through the large glass double doors to get to the lobby of Key Tower, or walk west through the length of the Marriott lobby to get to the street doors that take you out onto the corner of St. Clair and Ontario if the Justice Center or Standard Building is your destination. You can expect to pay $20 for parking if you are there for more than 15 minutes, but that is the daily max. I use this garage only if I am going to the Huntington Building, and unless you are there by 8:00 or 8:30, be prepared to see a “Garage Full” sign at the entrance. Fear not: this sign means nothing. I recently learned from Grace Hilpert-Roach, one of my co-founders of Cleveland Reporting Partners, to simply drive up, get your ticket, the gate will open, and there will be plenty of spots on the 5th or 6th level. Now, you’ll have to drive around and around a few times to get to the available parking, but unlike a lot of the older garages in Cleveland, it doesn’t take an eternity. The elevators are quickly accessible, and you will be to the security check-in before you know it. Expect to pay $16 if you are there for more than 15 minutes, but this is the daily max. 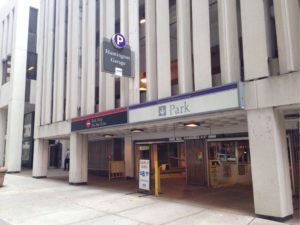 Although technically outside the Civic Center District of Downtown Cleveland, this gem of a parking garage will get you to many locations on Public Square without ever walking outside. All you need to do is take a short walk through a casino (which can be very surreal at 8:30 in the morning). The main entrance to the garage is off Ontario Street, just north of Huron, directly across the street from the iconic LeBron James Nike banner. The best part of this garage is you most likely will have to drive up only one level to find available parking very close to the elevator and the 2nd level pedestrian bridge to the JACK Casino. Casino security will want to check your bags, but if you tell them you’re just cutting through and you look like a professional, they generally just let you go about your business with little hassle. Once in the casino, follow signs for Terminal Tower, Tower City, or Landmark Office Tower, whichever you are going to, and you will be there in minutes; dry, warm, and with the bizarre feeling one gets being in a casino in the early hours of a weekday when you’re on your way to a deposition. Take note that a Cleveland Indians day game may drastically affect these prices, and it’s probably a wise decision to find another option for parking during these times. 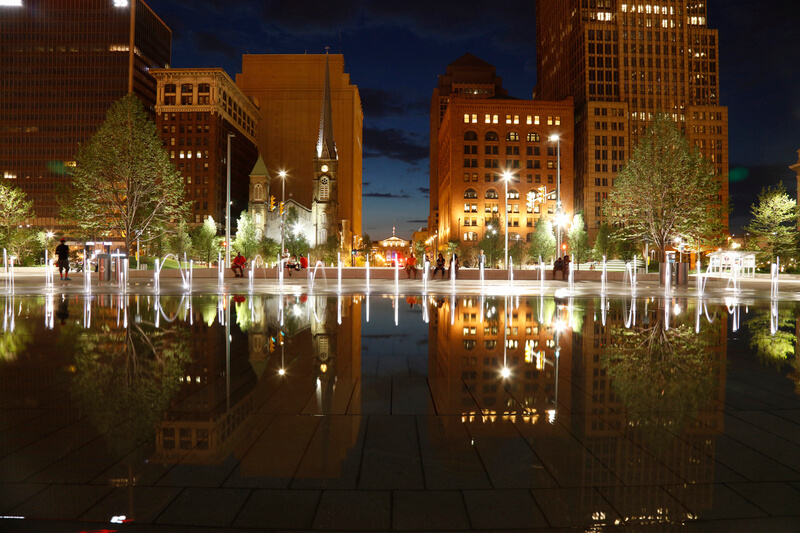 Named after its east and west borders of East 9th Street and East 12th respectively, the NineTwelve District is essentially the financial district of Downtown Cleveland. 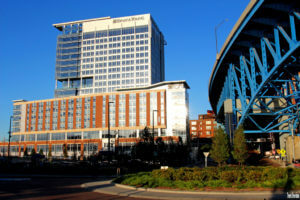 With the exception of Cleveland’s tallest buildings in the Civic Center District, the office and residential buildings in the NineTwelve make up the majority of Cleveland’s skyline. 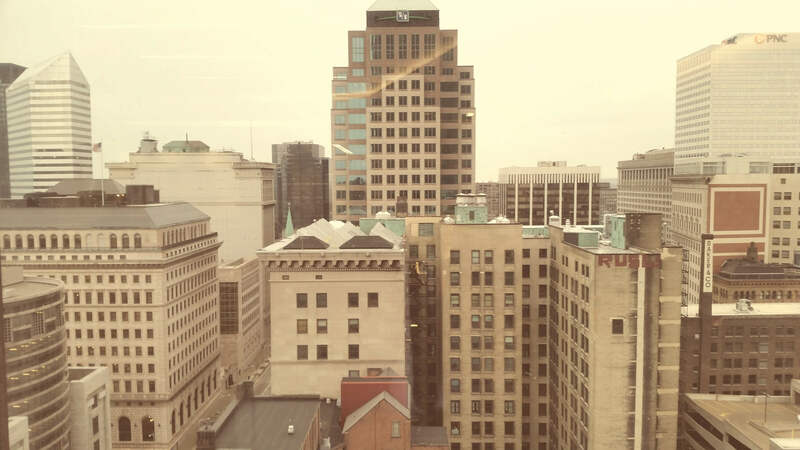 The southernmost border is Euclid Avenue, home to PNC Tower and the Old Huntington Building. The western boundary is six-lane East 9th Street, which is the major north-south street in all of Downtown Cleveland. This mile-stretch of East 9th from Euclid to the shoreline is home to thousands of professional offices housed in many recognizable office buildings, including Ohio Savings Plaza, the Amtrust Financial Building, the IMG Building, AECOM Building (formerly Penton Media, formerly Bond Court), One Cleveland Center, and Cleveland’s newly renovated glass Federal Building, just to name a few, as well as the residential towers of The Metropolitan at the 9 and The Residences at 1717. The northern border is Lakeside Avenue, including Willard Park (the Free Stamp), Jones Day, North Point Tower, and the DoubleTree by Hilton Cleveland Downtown. The westernmost border is East 12th Street, including Erieview Tower, Oswald Centre, Perk Plaza, and the western boundary of Reserve Square. Again, the NineTwelve is a relatively large district, but I have two favorite parking garages that will get you to any building within minutes after parking. The Galleria Garage is my absolute favorite place to park in all of Downtown Cleveland for many reasons. First, it is heated. If you’re like me and park outdoors at your home, when you park in this garage for an extended period and then return to your car, all snow and ice will have melted away. Second, after entering the garage, there is no driving around in circles to get to the available public parking. This garage is only one level, and you’ll be out of your car and walking to your destination in as little as 20 seconds. The entrance to the Galleria Garage is off Lakeside Avenue, just east of East 9th Street, and parking here will get you quickly to many office buildings in the northern part of the NineTwelve, including Erieview Tower, One Cleveland Center, IMG, AECOM, Jones Day, North Point, and the Federal Building. To get to Erieview Tower, simply take the escalator up to the Galleria and head east to the revolving door entrance to the lobby of the building. There is no time spent outside if this is your destination. If you’re going to One Cleveland Center, simply use the pedestrian walkway that takes you under St. Clair Avenue and up a flight of stairs into the lobby of the building. Again, no time is spent walking outside if this is your destination. Now, One Cleveland Center has its own parking garage attached to the building, but unless you work in the building and have an assigned spot, this garage fills up very quickly to the public and is a seemingly endless round and round to get to the few public spots available on the upper floors (which adds about five minutes to your total travel time). Therefore, I would highly recommend the Galleria Garage instead to park for One Cleveland Center. If you’re headed to IMG or AECOM, take the escalators up to the Galleria and head west through the mall to the revolving doors at the corner of East 9th and St. Clair. A quick walk across East 9th will get you to either building with very minimal time spent outside. 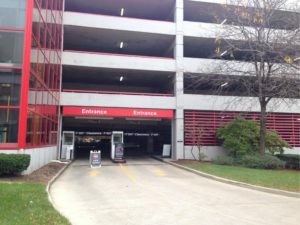 If you’re headed to Cleveland’s Federal Building, Jones Day or North Point, simply walk through the exit at the north end of the garage (the same way you drove in), and you will be on Lakeside Avenue. Cross East 9th to get to the Federal Building, or cross Lakeside to get to Jones Day and North Point. Very minimal time will be spent outside if these buildings are your destination. Expect to pay $16 for Galleria parking if you’re there for more than 15 minutes, and this is the daily max. Located at 999 Chester Avenue, the Huntington Garage is my go-to for parking if I’m working in the southern or middle part of the NineTwelve District. Parking here will get you quickly to many office buildings, including the Old Huntington Building, PNC Tower, Ohio Savings Plaza, Fifth Third Center, the Amtrust Financial Building, and Oswald Centre. One of the best things about this garage is that it is rarely ever full, and you will have to drive up only a level or two to find a decent parking space. The elevators are easily accessible once you park, and you will be out onto Chester Avenue in no time (although the elevators are very old, clunky, and sometimes very slow). If you’re going to PNC, Fifth Third or Amtrust Financial buildings, simply exit out to Chester and cross East 9th at Vincent Avenue and you’re there. 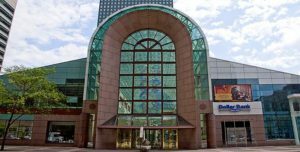 This is actually a shortcut to Fifth Third Center and Amtrust Financial, as the main entrances to these buildings are on Superior Avenue. But from Vincent Avenue, you can cut through the parking garages for both buildings to get to the back entrances and quickly into the building lobbies. This will shave off about five minutes of walk time, and very minimal time will be spent outside. Now, these three buildings all have their own parking garages attached to them off of Vincent, but unless you arrive by, like, 7:30 a.m., don’t even bother trying to find a spot in any of them. They will most likely be full, and you will waste five to 10 minutes of travel time having to turn around and finding another garage to park in. If you’re headed to Oswald Centre, exit out onto Chester Avenue, very briefly head east and then head north through the beautiful greenspace of Perk Plaza and enter Oswald through the building’s entrance on Walnut Avenue. If you’re going to Ohio Savings Plaza, the Huntington Garage is connected to this building, and you used to be able to enter the building through the back entrance without going outside. However, recently they have made this entrance only accessible to residents and office workers in the building and this is no longer an option for a visitor. So now you can simply exit out onto Chester, head west to East 9th, turn right and enter the building through its main entrance. If you’re going to the Old Huntington Building, look for the staircase in the lobby of the Huntington Garage that says “To 928 Building.” This will take you down underneath Chester Avenue and up to the old bank lobby to the elevator banks. No time will be spent outside if this is your destination. Expect to pay between $12 and $15 if you’re there for more than an hour, and this is the daily max. Take note that a Cleveland Indians day game may affect these prices, and it may be wise to park elsewhere during these times. 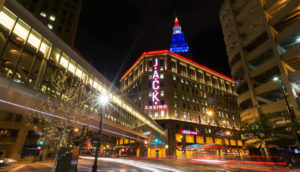 Known mostly as a residential and entertainment district of Downtown Cleveland, home to the Cleveland Indians, the Cleveland Cavaliers, the Cleveland JACK Casino, and the nightlife on and around East 4th Street, there are also many office buildings throughout the neighborhood, including the smaller buildings along East Prospect and Huron Avenue, and the larger skyscrapers along West Prospect Avenue. The southernmost border of Cleveland’s Gateway District is Carnegie Avenue. The western border is Ontario Street at the south end, where Progressive Field sits at the corner of Carnegie and Ontario. Farther north, the Western boundary would be West 2nd Street and Prospect, where you will find Skylight Office Tower at Tower City Center, and Landmark Office Towers, the corporate home to Sherwin Williams. The northern border is Prospect Avenue, and the eastern border is East 9th Street. Because there are relatively few offices in this mostly residential and entertainment Downtown Cleveland district, I have just one go-to garage when my job takes me here, and it’s a garage we’ve already covered in the Civic Center District at the beginning of this article. As stated before, this garage is easily accessible off of Ontario Street just north of Huron and is rarely ever full. A quick drive up to the second level, and you’re parked and headed to the elevators. If you’re going to the skyscrapers on West Prospect, including the Midland Building, Republic Building and Skylight Office Tower, take the elevators at the west side of the garage down to street level, briefly walk up Ontario to Prospect, cross Prospect, and you’re there. If you’re headed to the smaller office buildings along East Prospect and Huron, take the east elevators that will dump you out onto East 4th Street between Prospect and Huron and you will quickly arrive at your destination. Once again, be prepared to spend $12 if you’re there for more than 15 minutes, and it might be a good idea to stay away from this garage when the Cleveland Indians are playing a day game. 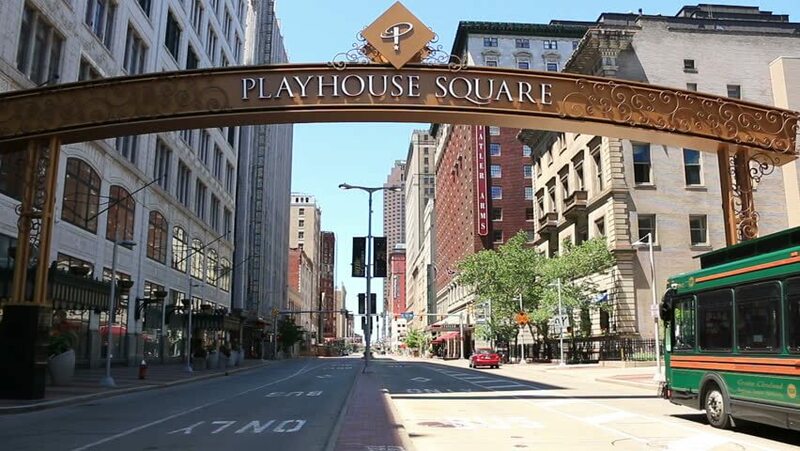 On the southeast side of Downtown Cleveland lies historic Playhouse Square, home to the second largest theater district in the country outside Manhattan. However, it is also home to several older and newer office skyscrapers, such as the very modern, glassy US Bank Centre, the Halle and Hanna Buildings, and the Bulkley Building, to name a few. 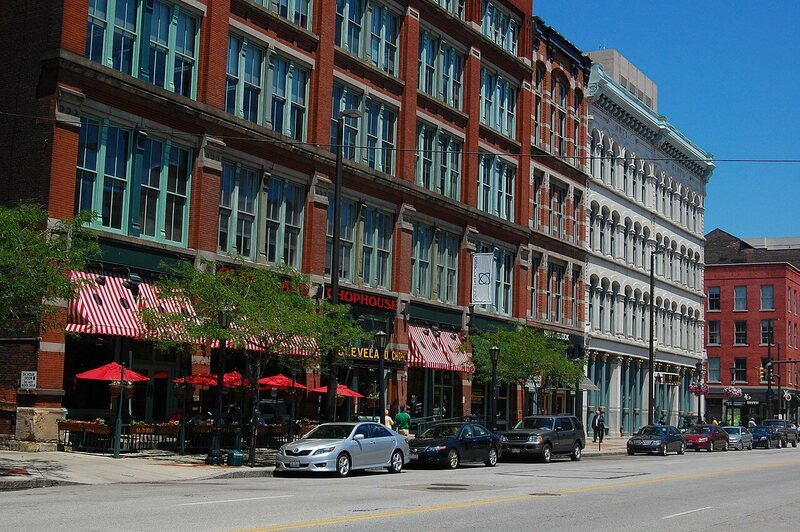 The main drag of Playhouse Square is Euclid Avenue between East 13th and East 17th Streets. The western border then extends down East 14th Street to Prospect Avenue at the southernmost boundary. While Playhouse Square may be one of the smaller Downtown Cleveland districts, I have two garages that I use regularly, depending on where I’m going. 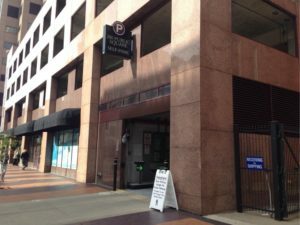 Although this garage is technically located outside the boundaries of Playhouse Square, covered and heated pedestrian walkways will take you right into the heart of it. The entrance to this garage is at Chester Avenue, just east of East 13th Street. Rarely full, you will only have to drive around in a few circles to get to the available parking. Once you are parked, take the elevator to the second level to get to the glass walkway into several theaters and the Bulkley Building, which will then take you out onto Euclid Avenue and the Halle Building. This is a fantastic garage that lets you avoid driving on frustrating Euclid Avenue altogether, and you can expect to pay $15 if you’re there for more than an hour. And if your destination is either the Bulkley Building or the Halle Building, there will be zero or very minimal time spent walking outside. The entrance to the US Bank Garage is at the corner of East 14th Street and Prospect Avenue. This is one of the very few garages I use in all of Cleveland that are attached to the building. It rarely is full, you don’t have to drive around in circles all day to find a spot, and if your destination is US Bank Centre, you’re into the lobby of the building in less than a minute after parking. Across the street on East 14th is one of the entrances to the Hanna Building, and I will also use the US Bank Garage when I have a deposition to get to in this historic building that takes up an entire city block from Euclid to Prospect (if you include the Residences at Hanna). Simply take the elevators or stairs down to street level on East 14th, cross the street and you’re there. You can expect to pay $15 if you’re there for more than an hour. 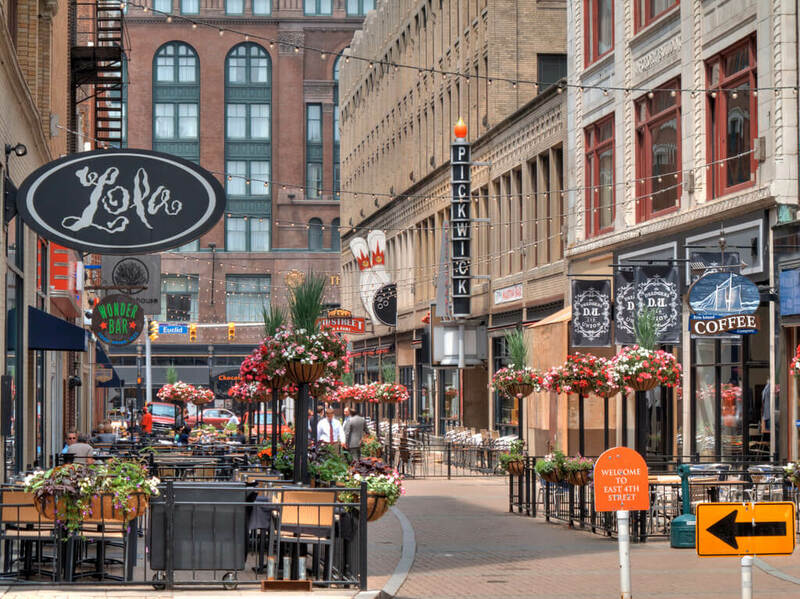 The mid to late ‘90s saw one of the first resurgences of Cleveland’s downtown neighborhoods when countless buildings in the Warehouse District were repurposed and refurbished from abandoned warehouses into higher end apartments, restaurants, clubs, and fashionable, boutique office spaces. Starting with West 6th Street, the progress continued, and now most all of the buildings in the entire district are occupied and thriving. The southernmost boundary is West Superior Avenue, which includes the larger office buildings in the neighborhood, including the Rockefeller Building, State Office Tower, and the new Federal Courthouse. The western boundary is West 9th Street, which is lined with historic buildings housing street-level storefronts and restaurants, but also renovated office space and residential units on the upper floors. The northern boundary is Lakeside Avenue, and the Eastern boundary is at West 3rd Street. Cleveland’s Warehouse District is probably one of the most frustrating neighborhoods to find convenient parking, and it is also home to the largest collection of wasted prime real estate in any major city I have ever been to in the form of entire city blocks of unsightly surface parking lots. Although there are many lots in the district, my go-to is LAZ Parking surface lot at West 9th and St. Clair. The main entrance is off West 9th, just south of St. Clair, and there is usually a space or two available no matter what time of day. Also, this lot is now automated with a credit card swiper, unlike a lot of the other choices in the neighborhood which still require cash by a human being, or one of those slot boxes that can cause you serious delay as you try to stuff a five and three singles into a slot the size of a large coin. Now, you can try your luck with other surface lots that might be closer to your final destination, but in my experience, it’s probably best to just get the easy parking over with at LAZ at West 9th and walk the rest of the way to wherever you are going. This lot is centralized to the district, so you can get to wherever you’re going with a 5-minute walk or less. You can expect to pay $8.50 whether you’re there for one minute or all day, and this is the daily max. Cleveland’s Flats District is in the middle of an enormous resurgence (particularly the East Bank), the most notable addition being the ultra-modern Ernst & Young Tower. 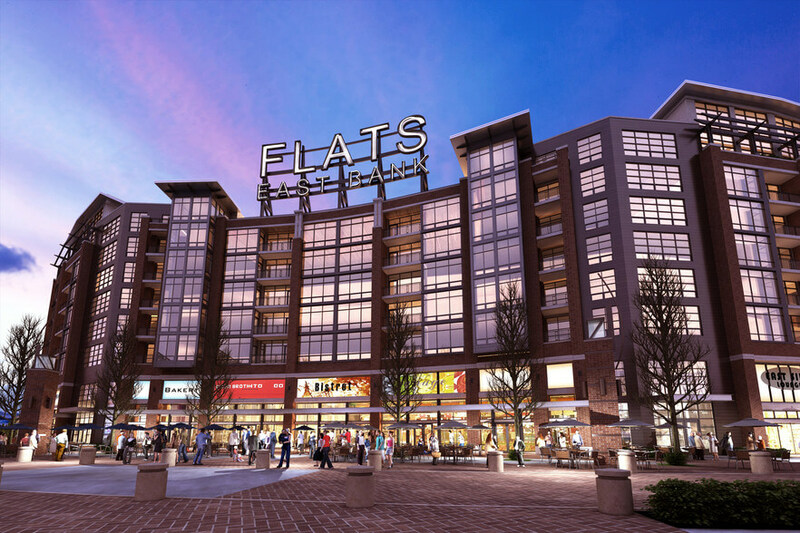 Located down the hill west from the Warehouse District, The Flats is also home to an abundance of new construction residential units, hip restaurants and bars, and the Aloft Cleveland Downtown hotel. There is only one major office building in the Flats, and that is the Ernst & Young Tower at 950 Main Avenue, and I have one garage I always park in when I’m down here, which will also get you quickly to the northwest corner of the Warehouse District. 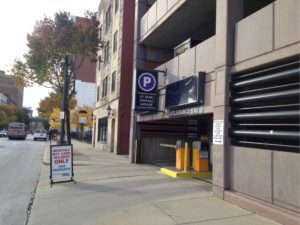 Attached to both the Ernst & Young Tower and the Aloft Hotel, the entrance to this garage is at Front Street, just west of West 9th Street and the Port of Cleveland. Being that this is a relatively new structure, its design is efficient, and you will find available parking with just a couple right turns up to the 3rd level. The elevator bank is centrally located, and you will be in the lobby of the Ernst & Young Tower in minutes, if not sooner, after parking. The Front Street Garage is also a convenient place to park if your destination is any of the office buildings at the north end of West 9th Street, as it is just a short walk up Main Avenue to the Warehouse District. You can expect to pay $16 if you’re there all day, and this is the daily max. Just like a cab driver or a bike messenger, veteran freelance court reporters in Cleveland, Ohio have been to and inside just about every building downtown and know all the best places to park where the ultimate goal is being on time, not saving a few dollars. After doing this job for 16 years now, I never stray from the parking recommendations given in this article. If you park in the garages I have listed, you will always be on time and will have to add very few minutes of walk time to the drive time your GPS has given you to arrive at your downtown destination. Oh, you’ll probably arrive dry and warm, too … and that’s parking smarter.